I didn’t take much notice of Scream Queens when it first started airing in September because the reviews were so dire, and I’d long since given up on Ryan Murphy’s other horror anthology series, American Horror Story*… but then trailers started appearing on E4 in anticipation of its UK debut next Monday, and my curiosity was piqued. I’ve now seen the first two episodes for myself, and have to say I’m quite enjoying the show so far. It’s not as bat-crap-crazy (or stomach-churning) as AHS, and not quite as funny (or heart-warming) as The New Normal… but the Scream-2-meets-Heathers premise, in which a snobby sorority is stalked by a costumed serial killer (or two…? ), makes for a very watchable and amusing “seasonal” distraction. 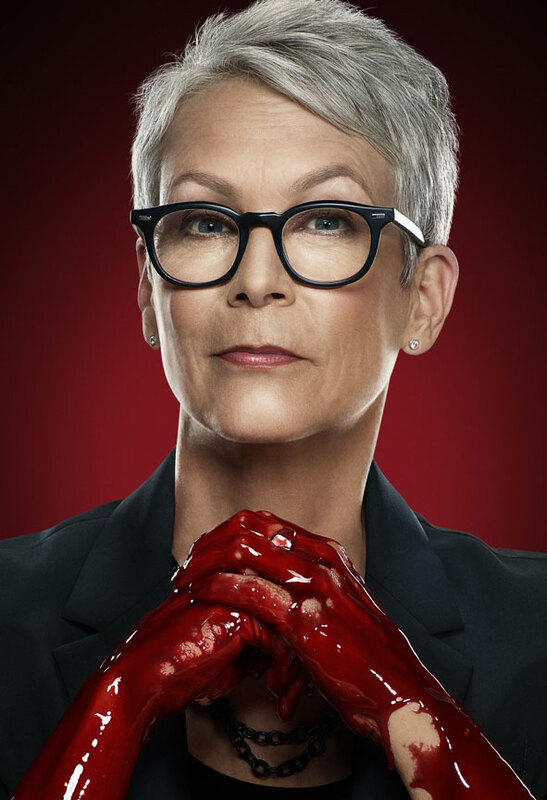 Plus, it’s always nice to see Jamie Lee Curtis doing more comedy, and riffing on her own genre legacy, playing the university’s embattled dean, ‘Cathy Munsch’. Meanwhile, Emma Roberts plays ‘Chanel Oberlin’, the racist, homophobic, and possibly homicidal president of Kappa Kappa Tau… Skyler Samuels plays ‘Grace Gardner’, a principled and wilful fresher looking to follow in her mother’s footsteps and restore the sorority to its former sisterly glory… Abigail Breslin, Ariana Grande, and Billie Lourd play Chanel’s obedient, anonymous minions… Keke Palmer plays ‘Zayday Williams’, a “stereotypically sassy” African-American pledge… and Nasim Pedrad plays the sorority’s time-warped national president ‘Gigi Caldwell’, who rocks up on campus hoping to save KKT’s reputation, even as the dead bodies pile up around them! 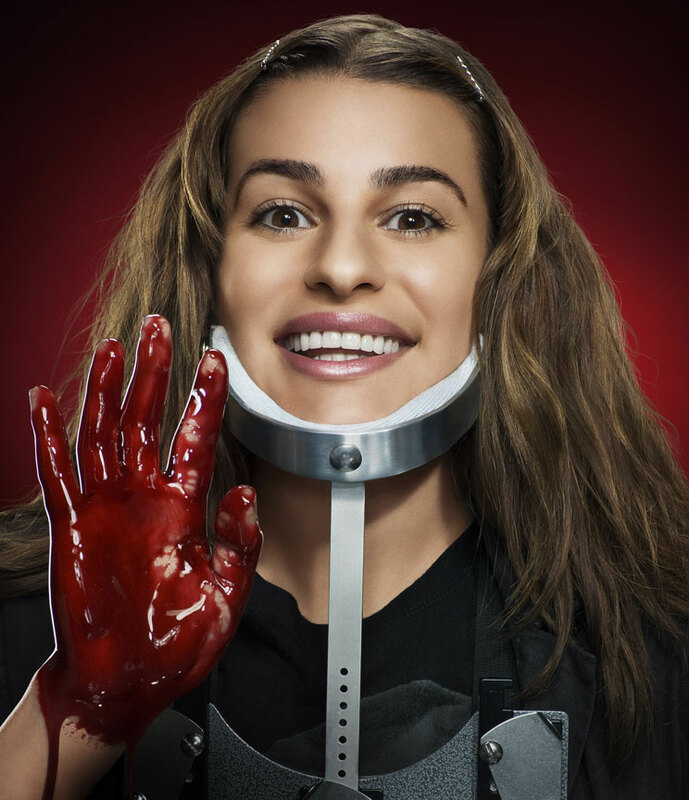 One of the other pledges is a gawky girl with a neck-brace named ‘Hester Ulrich’, and the whole way through the first episode I kept thinking that the actress playing her kinda looked like Lea Michele. When it was over I raced to Wikipedia to find out who the girl-who-looks-like-Lea-Michele was… turns out, it’s actually Lea Michele! I was thrown by the fact that she barely spoke (or sang!) at all in the pilot, which seemed like such a comedown considering her prominence in the hugely successful Glee… but according to an interview with Entertainment Weekly, Michele’s just happy to be working with Murphy and his co-creators (Brad Falchuk and Ian Brennan) again: “Ryan and Brad and Ian are geniuses, and they get it right. They get it right as a duo, and they get it right as a trio. So I trust Ryan with my life – literally, my career, my life, whatever the f*ck he wants me to do.” Bless. Thankfully Hester gets a lot more dialogue in the second episode, and has quickly become my fave character, thanks to her upbeat enthusiasm and macabre outbursts…. plus the fact she looks like Lea Michele, obvs. This entry was posted in Rants about TV and tagged Abigail Breslin, American Horror Story, Ariana Grande, Billie Lourd, Emma Roberts, Hester Ulrich, Jamie Lee Curtis, Keke Palmer, Lea Michele, Nasim Pedrad, Scream Queens, Skyler Samuels. Bookmark the permalink.